High placed female buddhist priest at Zenkouji temple in Nagano. She is holding a Hossu staff with bundled hair, and wearing a monk’s stole, called Kesa, made of sumptuous silk brocade. Kesa are draped over one shoulder and under the opposite arm in order to wrap it around the body. They are believed to resemble a garment made for Buddha by his mother. Of a simple rectangular form, they have barely changed since Buddhism was first introduced in Japan during the sixth century. 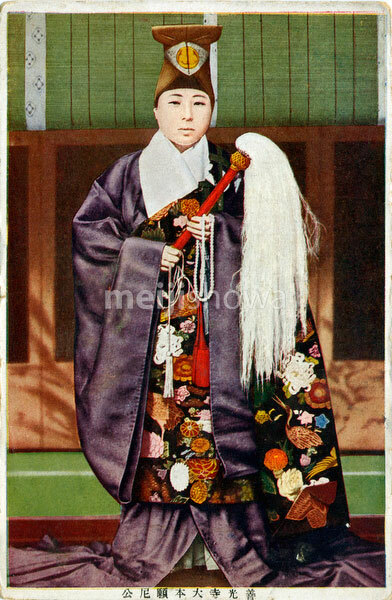 The title on this postcard reads Zenkouji Daihongan Nikou (善光寺大本願尼公).